Experience the quintessential suburban living with a pick of Sarasota homes for sale in the Provence. It is a small community of just 18 residences conveniently located off Honore Avenue which is arterial to major local road corridors including Clark, Proctor and Ashton Roads. Custom builder Neal Signature Homes, the luxury unit of prolific regional builder Neal Communities, started developing this property in late 2015. As its name suggests, Provence was developed along the charm and sophistication of its namesake region in France. 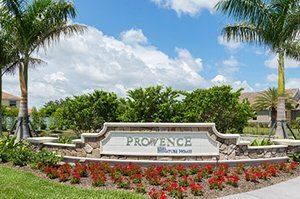 Nestled in a coveted nook just a few minutes’ drive west of Interstate 75, Provence was crafted as an exclusive and intimate gated community. Its developer also provided Provence with maintenance-free features that its residents would certainly relish having. 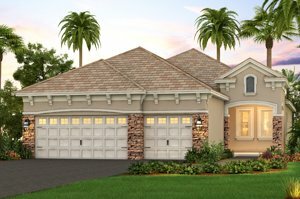 The Lakewood Ranch-based Neal Signature Homes brought to Provence several home-design selections from its award-winning Cove Series. These choices each has its own private pool, and their floor areas range between 1,900 and 2,400 square feet, featuring three- to four-bedroom layouts. Expansive outdoor living spaces and luxury features form a common theme for these builds. Provence particularly draws pride from its Marseille home model which copped Best Overall in the 2017 Manatee Sarasota Parade of Homes after it was likewise adjudged as Best in Curb Appeal, Master Suite and Architectural Detail. A rendition of this model was sales-listed in September 2017 at a discounted price in the high $400s, flaunting three bedrooms and two-plus baths within its floor area of 2,247 square feet. Provence homes for sale draw market strength from the completely integrated engineering and building operations of Neal Signature Homes. This builder is likewise networked with Charlene Neal PureStyle design services and Waterscapes Pools & Spas, Florida’s fifth largest pool builder. Besides its Parade of Homes’ awards, Neal Signature Homes is also a consistent winner in the environment-centric Aurora Awards. The suburban neighborhoods around Provence are well-established and thus contribute a share in the delightful living offered in this community. Bordering north and east of Provence is the sprawling Three Oaks development. Directly across west of the Neal Signature Homes’ builds is the smaller neighborhood of the Enclave at Ashton with roughly the same acreage size as Provence. A project of national builder D.R. Horton, Luna Bay, which was also launched 2015, sits adjacent south of Provence. Developer interest and market demand for Sarasota homes for sale in and around this community largely draw steam from the nearby top-rated schools, life and leisure centers and health care facilities. At Clark Road just south of Provence, Palmer Crossing hosts several retail shops and restaurants. Also along this road stretch, Sarasota Memorial Hospital provides the services of and facilities a local health care center. As convenient, the nearby Clark Road extends east to an interchange of Interstate 75 for trips to the business and commercial centers located north around the Lakewood Ranch area. Westward, Clark Road opens easy access to more lifestyle choices including the beach-based pleasures of the Gulf Coast in Siesta Key. Below are the current real estate listings available at Provence.